I had a car when Jenn and I first started dating. It wasn't much of a thing –– an old Peugeot that would later try to kill me with failing brakes –– but I think it helped our budding romance. I was able to take her places. Specifically, I was able to take her to the various outdoor places of which Wales has an abundance. Jenn is something of a country girl at heart. Or, at least, as 'country' as anyone from England can be. (Remember that southern England is the most densely populated area in Europe.) And when she is out in a natural space she feels reconnected, rejuvenated. 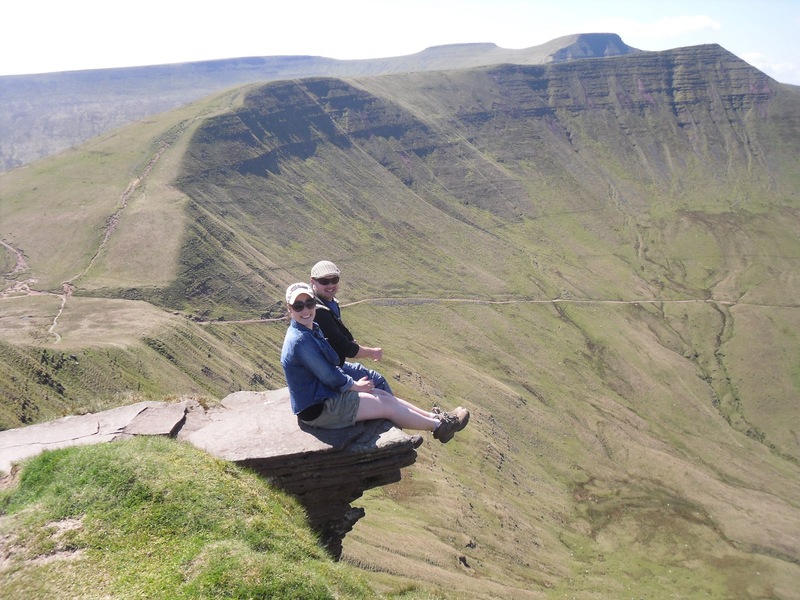 "This is my church," she told me a few years ago, when the two of us hiked to the top of Pen y Fan to watch the sunrise. I suppose I'm the same way. I became the person I am when my family moved to Minnesota, where I was free to swim in Nine Mile Creek and wander the infinite woods on the banks of the Minnesota River. One of the things that drew me to Wales is its accessible natural beauty. This tiny bit of land that is no larger than the Chicago metropolitan region is home to three national parks, five Areas of Outstanding Natural Beauty and a whole hell of a lot of other spots that are unofficially just lovely. After the old Peugeot gave up on me in late 2011, I bought a £500 Honda that held up for less than four months. It was so cantankerous and expensive that Jenn and I decided we were better off without a car. After all, both of us have jobs that allow us to cycle to work, and pay cheques that by their minisculity (1) strongly reinforce such behaviour. Why get a car to only use occasionally, the rest of the time having it sit out on the road as a target for drunken chavs? Because cars take you places, yo. One of the things I have learned from my recent exhaustingly long and unending bout of depression is that I need the ability to go. Sometimes the place I go isn't so terribly important; I just need to be going. But frequently, back in the days when I had a car, I found myself going somewhere beautiful. This is one of the truths about personal cars that environmental groups hate to admit: they can take you places that a public transportation system goes nowhere near. Such is the flaw of most public transportation: it takes people where they have to go, rather than where they want to go. But I've come to realise, with increasing panic and anxiety lately, that getting to the places we want to go can sometimes be as important as getting to the places we have to go. So, I'm working on that. I am trying, desperately, to manage a way to bring some form of individual motorised transportation back into our lives, be it a car or a motorcycle. Accomplishing that will still take some time. Fortunately, this past weekend we had something better: friends with cars. Jenn and I were not only able to get out to the sort of natural scenery that makes life worth living, but to enjoy it with some of the people who help to make our everyday scenery more tolerable. Clint had devised the walk: an 8-mile circular stretch running from Torpantau to Fan y Big, staying always within the shadow of Corn Du and Pen y Fan. I realise these are probably just unpronounceable words to you. And even if you understood the meaning of the Welsh place names (2) your imagination likely wouldn't run wild. But put simply, this walk was the sort of thing I spend my days promoting for the UK's national parks. Indeed, all the above unpronounceable places are to be found within Brecon Beacons National Park, one of the 15 members of the UK's national park family. Visit 'em all! Tell your friends! Our friends and we had packed into two cars and trundled up the A470, then along a series of comically narrow roads (in Wales one is never more than a half hour's drive from the year 1250 when it comes to road quality), the six of us each bringing along bags loaded with sandwiches and crisps and fruit and chocolates and cakes and tea and coffee to consume along the way. When your friends become a promotional photo. All these delights made the first long incline of the walk a challenge, but soon enough we were up onto the undulating ridge that eventually leads to Pen y Fan, the highest peak in southern Britain (3). The weather was perfect -- sunny and not too cold. A Briton would have phrased that differently, proclaiming the weather to be sunny and not too warm. But as an American I feel it is never too warm in Britain. "Too warm" is impossible to achieve here. After a few hours of walking we found a spot, some 2,400 feet above sea level, and stopped to eat lunch. Stretching out in front of us was the endless quilt work of British farm fields, dotted with little villages and sewn together by hedge-hidden lanes. This was a Mountain Dew Moment, mis amigos. We just needed a rope swing. Or, well, it was a British version of a Mountain Dew Moment: six people amiably sharing tea and chocolate biscuits. No one shouted "woo." Not even once. It's not the done thing, old boy. We carried on to Fan y Big, then scrambled down to walk along the Neuadd River, stopping at one point to take off our boots and wade into its icy current up to our shins. For those of you playing along at home, don't be fooled by the word "river." It was a stream, no more than 10 feet across and never any deeper than one's knees. But it was still enough to completely soak Clint when he fell in. That's when you know you're having fun: when one of the group ends up falling into the water. Fortunately, he dried out on the way back to the cars. Then it was back down to Penarth, where Jenn and I hosted everyone for dinner. Burritos and beer and red wine. Jello and ice cream for dessert. We stayed up into the night playing dominoes, drinking all the beer and coming up with our own stupid jokes. There was nothing so terribly special about it, but for the fact it was happening. I have a personal rule that I don't drink more than three beers in a setting unless I am in a really good mood and can be certain the alcohol won't find its way to the dark side of my thoughts. I almost never drink more than three beers; on this night, I had five bottles of Corona. With the beer gone and the day's hike wearing on them, everyone filed out of the flat a little before 1 a.m. -- an early night for that particular group. Afterward, as Jenn and I lie in bed, she turned to me and said: "I think that was probably the best day of the year so far." Yeah, I think it probably was. (1) To my knowledge, this is not a word. But it should be. 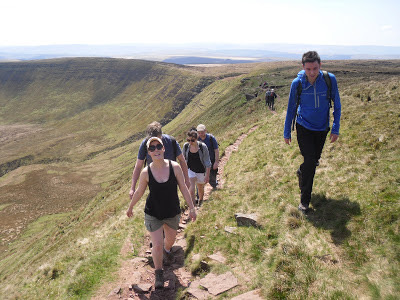 (2) Torpantau = "Bottom of the hollows"
Fan y Big = "Peak of the alluvial fan"
Corn Du = "Black peak"
Pen y Fan = "Top of the alluvial fan"
(3) This is what we in the UK National Parks PR wing always say about Pen y Fan: "the highest peak in southern Britain." I can't help but question that claim. Take a look at the land mass that is Great Britain (ie., the island that contains England, Scotland and Wales). I would argue that the whole of Wales could be classed as being on the bottom bit of that land. Which would mean that Snowdon should carry the "highest peak in southern Britain" tag. sometimes it's the simple things that makes life so enjoyable. Friends and spending a day with Nature and just breathing and enjoying the sunshine. Looks like a lovely day out peeps. Weather's good for this w/e too. 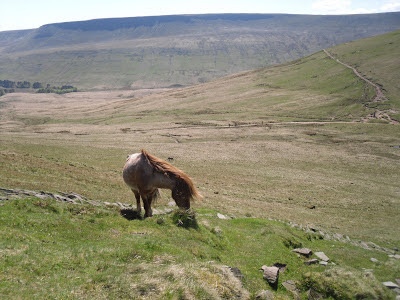 Me, think we'll take a trip to Hay-on-Wye via Abergavenny and Hay Bluff on Saturday. Stunning! I think you're amazingly lucky to do the job you do. It was my dream (and goal) to work at CADW. Never managed it, of course. So more power to you Chris! Glad you guys had a lovely day.